CHALK IT UP Let the easel take a stand with our table top Farmer's Market Chalkboard Signs, Set of 2, at your next party or get-together to welcome your guests, showcase your menu, or times of events. GREAT SIZE Almost 1-Foot-Tall the larger board this piece exactly measures as follows: 6 3/4 x 8 3/4 x 11 3/4 and the smaller one measures 5 1/2 x 6 3/4 x 8 3/4 Inches. These versatile pieces are designed to be placed in the most convenient spots to help everyone stay on track with to do lists, play-dates as well as down to earth fun, like doodling. A RUSTIC TOUCH ANYWHERE Perfect for perching on side tables, kitchen counter-tops and on stairs, this free standing piece is hinged at the top. DOUBLE SIDED each piece is inset with boards on both sides. A practical side chain keeps these pieces balanced while adding country style charm. AN IDEAL GIFT, it's perfect to celebrate holidays, birthdays, weddings and many more. So gorgeous, you'll want to keep it at home for yourself. Enjoy! By Whole House Worlds Welcome to the product line of Whole House Worlds. The New York based company offers high quality, stylish products for every room in the house, and beyond. From the kitchen, to the living room, to the bedroom, dining room, home office, closet and garden: Our criteria are comfort, quality, style and value. 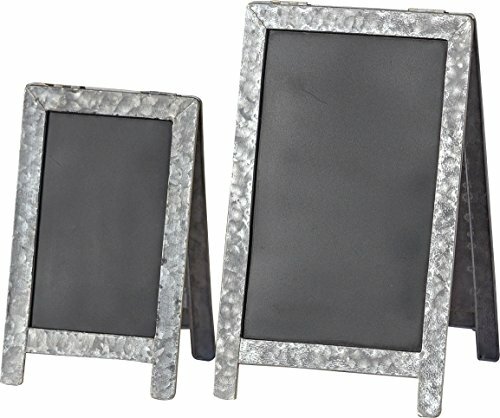 CHALK IT UP Let the easel take a stand with our table top Farmer's Market Chalkboard Signs, Set of 2, at your next party or get-together to welcome your guests, showcase your menu, or times of events. GREAT SIZE Almost 1-Foot-Tall the larger board this piece exactly measures as follows: 6 3/4 x 8 3/4 x 11 3/4 and the smaller one measures 5 1/2 x 6 3/4 x 8 3/4 Inches. These versatile pieces are designed to be placed in the most convenient spots to help everyone stay on track with to do lists, play-dates as well as down to earth fun, like doodling. A RUSTIC TOUCH ANYWHERE Perfect for perching on side tables, kitchen counter-tops and on stairs, this free standing piece is hinged at the top. DOUBLE SIDED each piece is inset with boards on both sides. A practical side chain keeps these pieces balanced while adding country style charm.